All kids love animals right? 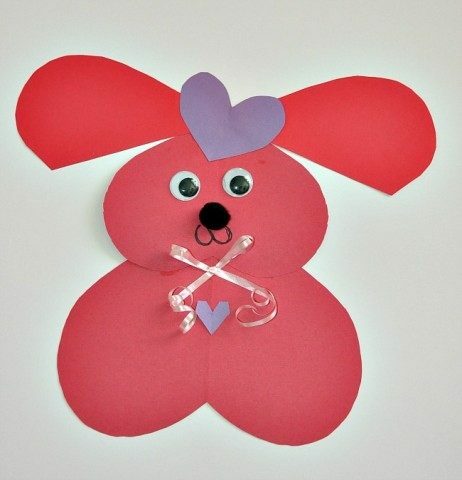 How about creating some critters and figures using paper hearts as a Valentine craft. We love to create images using shapes and have done a few in the past – we made a turkey and Christmas trees using geometric shapes. 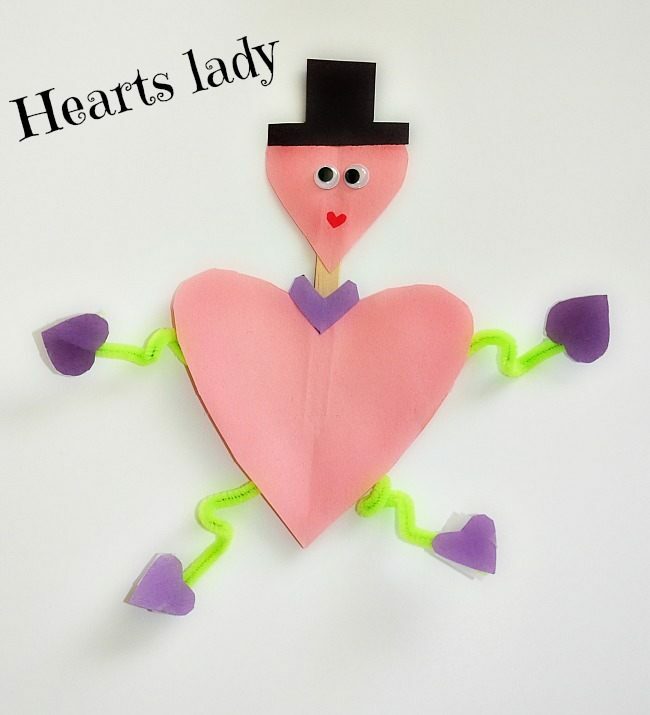 For an easy Valentine craft, we used heart shapes to create critters, animals and even a cute lady. We have been hitting a local library frequently these days and every now and then they have a simple craft/art session for kids. We try to improvise on the activity and it is a wonderful opportunity for my kid and I to discuss what we liked and didn’t like about the project. This gets her imagination going and we create things. But for this craft, we loved what we saw and recreated the same and many more. We have here a dog, a worm, a cute heart lady and a little mouse. The hearts dog is by far our favorite. It’s made from 1 large and 2 medium sized hearts. The large heart for the lower half and the medium for the upper half of the body. Cut the other medium through the center vertically for ears and there you have it. To create a challenge, I laid the body parts and invited my 4 yr old to figure out how to put the ears. The invitation has a hidden mathematical concept – Heard about Flip, Slide and Turn ? It was fun to see her brain work to solve the cute puzzle. 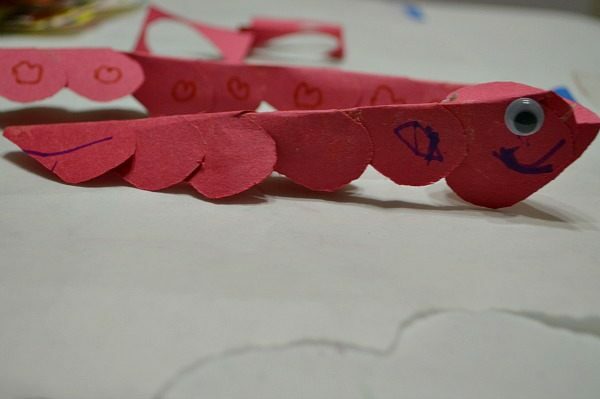 For a simple worm, we cut out small hearts and attached them one over the other to create a long string of hearts. 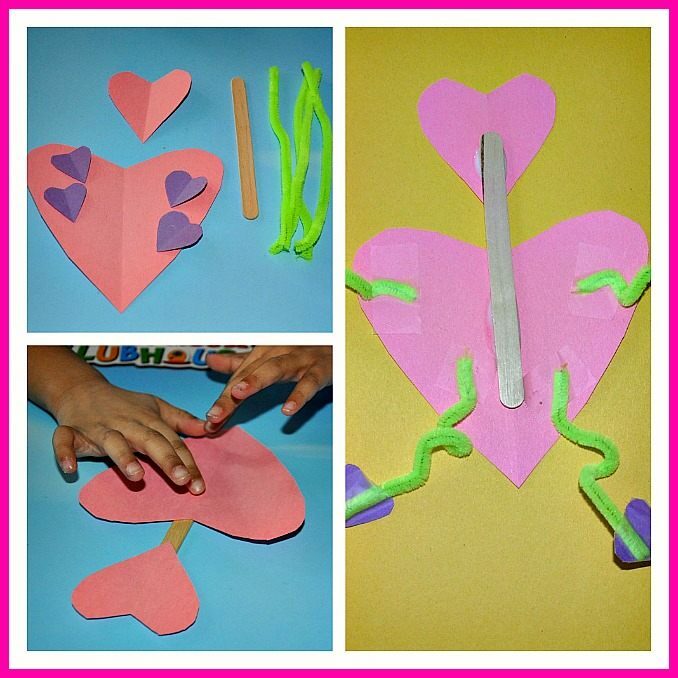 This is a fantastic fine motor exercise because she has to hold on the heart while trying to apply glue. We finished it up with googly eyes and a smile. For any art/craft/learning activity I always make sure we discuss the process before hand and have the child come up with ideas about the process. My next prompt was to create a human figure. We talked about what parts we need: Head, Body, Hands and Legs. We cut out various sized hearts to create the body parts and used pipe cleaners to create movement for the arms and legs. Another learning opportunity: Do a simple experiment and see what happens when you use craft sticks for the arms and legs. Does it wiggle? Like we always say, you can turn any activity into an thinking exercise and not entirely an adult directed project. We went on to create a mouse card. 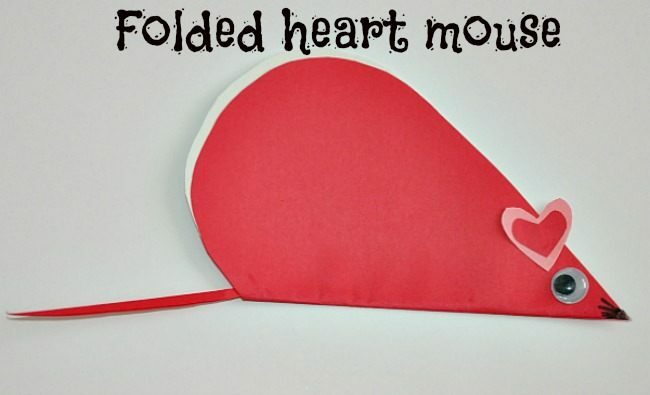 To create the mouse, we folded 2 hearts, one within the other. The inside heart is slightly bigger than the outside heart, just for looks ! The folded hearts becomes the body. We attached a tail and smaller heart for the ears. Write your message on the inside. Isn’t he cute? After doing a string of art, crafts and learning activities with the kids, I have been thinking that we are not doing *just* crafts/activities. 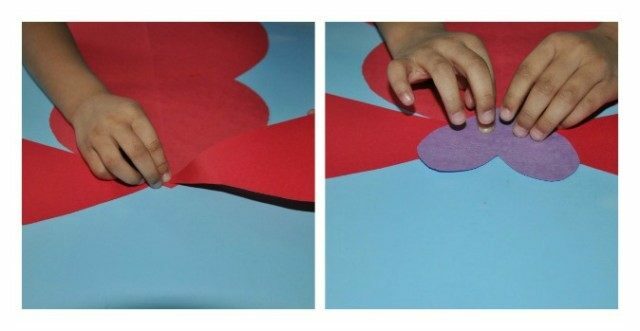 With a simple Valentine craft comes a wide array of learning opportunities and the obvious connecting and bonding with the kids. Hopefully they remember these good times! Other Valentine’s day crafts we have done. More Valentine’s day crafts on our Pinterest Board as well.